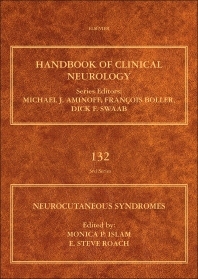 Neurocutaneous Syndromes provides the most updated and comprehensive resource on the disorders that lead to the growth of tumors in various parts of the body, those caused by the abnormal development of cells in an embryo and characterized by the presence of tumors in various parts of the body and eyes, including the nervous system, and by certain differences in the skin. The most common neurocutaneous syndromes include, neurofibromatosis, Sturge-Weber syndrome, tuberous sclerosis, ataxia-telangiectasia, and von Hippel-Lindau disease. Symptoms vary widely and while present early may not express until later in life. As molecular medicine and genetic science is continuing to impact our understanding of neurocutaneous syndromes, this book also includes the latest molecular and genetic science. Monica Islam, MD is a child neurologist with fellowship training in clinical neurophysiology and electroencephalography (EEG). She is on staff at Nationwide Children’s Hospital and Assistant Professor of Clinical Pediatrics at The Ohio State University College of Medicine. A native of Virginia, she completed her undergraduate degree at the University of Virginia and her medical degree at Eastern Virginia Medical School. Her pediatrics and child neurology training occurred at the University of Alabama at Birmingham, and her neurophysiology training took place at Wake Forest University Medical Center. She has authored several book chapters on neurocutaneous syndromes. E. Steve Roach, MD is Professor of Pediatrics and Neurology and Vice Chair for Clinical Affairs of the Department of Pediatrics at The Ohio State University College of Medicine. He also serves as Chief of the Section of Pediatric Neurology at Nationwide Children’s Hospital. Roach has served as President of the Child Neurology Society, the main professional organization of child neurologists in North America. Roach is the Editor-in-Chief of Pediatric Neurology and a member of five other journal editorial boards. He has written eight books, including the first textbook on stroke in children, now in its third edition. He has published extensively on tuberous sclerosis complex, Sturge-Weber syndrome, and other neurocutaneous syndromes.